The Art Trail Project is a directory of free public art trails and sculpture trails. Every year around the globe, hundreds of amazing public art and sculpture trails take place. Finding out about these events often relies on word-of-mouth. The Art Trail Project was created to map these free public art trails, create a permanent record of them and celebrate the art trails happening around the globe right now. An art or sculpture trail is a predefined route through open-air galleries of outdoor art and sculptures (Wikipedia). Art trails enable you to explore new areas and discover amazing art and sculpture, often in support of local charities, while getting exercise and enjoying the outdoors! If you like art and sculpture or you're a fan of treasure hunts, Geocaching, Swarm, Waymarking or Pokémon Go, then you're going to love doing an art trail! Who is behind the Art Trail Project? 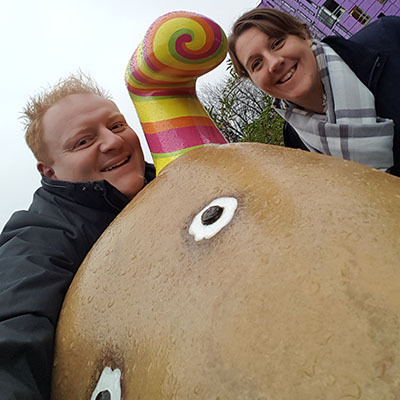 We are Richard and Louise, a couple from the United Kingdom City of Culture who love completing art trails! Our first art trail involved chasing more than 50 Gromit figures located around Bristol, United Kingdom as part of 'Gromit Unleashed' in support of Bristol Children's Hospital. Since then, we have become hooked and have completed countless more trails around the world. We often struggled to find where and when the art and sculpture trails were taking place, so we created this not-for-profit website to help you discover your next exciting art trail! How can I contribute to the Art Trail Project? The Art Trail Project is a community website driven by you! New art and sculpture trails are being added all the time. If you love art trails, consider becoming a contributor to the site. Simply register (using Facebook, Twitter or Google) and then click "add an art trail" or you can share your photos with other users to add to an existing art trail. Don't forget to mark the trail as complete if you have already finished it!